The research, conducted by a team in the Faculty of Natural Sciences, found that field-realistic doses of a neonicotinoid pesticide affects the behaviour of bees – ultimately interfering with the type of vibrations they produce while collecting pollen. Dr Penelope Whitehorn, the University of Stirling Research Fellow who led the research, said: "Our result is the first to demonstrate quantitative changes in the type of buzzes produced by bees exposed to field-realistic levels of neonicotinoid. "We also show that buzz pollinating bees exposed to the pesticide also collect fewer pollen grains." Dr Whitehorn, working with Associate Professor Mario Vallejo-Marin, looked at a complex type of pollination, called buzz pollination, in which bees use vibrations to remove pollen from flowers. They studied captive colonies of bumblebees visiting buzz-pollinated flowers, monitoring their behaviour and collecting bee buzzes using microphones. The scientists then analysed the acoustic signal produced during buzz pollination to detect changes in buzzing behaviour through time. They found that chronic exposure to the pesticide, at similar levels to those found in agricultural fields, interfered with the vibrations of the bees as they collected pollen which, in turn, reduced the amount of pollen collected. Dr Whitehorn explained: "We found that control bees, who were not exposed to the pesticide, improved their pollen collection as they gained experience, which we interpreted as an ability to learn to buzz pollinate better. "However, bees that came into contact with pesticide did not collect more pollen as they gained more experience, and by the end of the experiment collected between 47% and 56% less pollen compared to the control bees." Dr Vallejo-Marin said: "Our findings have implications for the effects of pesticides on bee populations as well as the pollination services they provide. They also suggest that pesticide exposure may impair bees' ability to perform complex behaviours, such as buzz pollination. "The next step in this research would be to establish the mechanism by which the pesticide is affecting the bees. 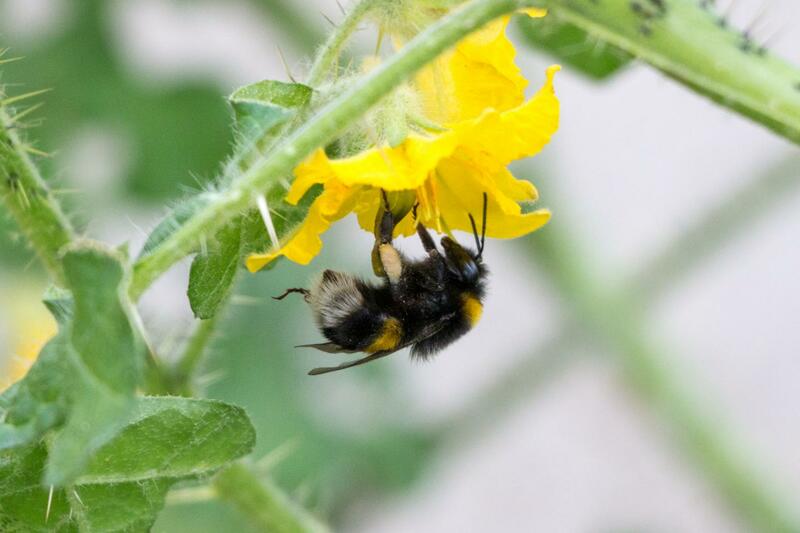 We think that pesticides may be affecting the memory and cognitive ability of bumblebees, which may be very important when conducting complex behaviours." The paper, Neonicotinoid pesticide limits improvement in buzz pollination by bumblebees, is published in Scientific Reports.